Combine first 3 ingredients in a large bowl, stirring until well blended. Add chicken, celery, cashews, and green onions; stir well. 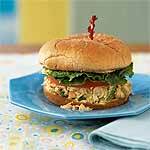 Serve chicken salad on buns.